The list below is a beginning list to attempt to identify which lupines might be found east of the Cascades in Washington and Oregon. Unfortunately, the taxonomy for the lupines is not consistent between the two states (or the USDA), and several species may be listed twice under different names which are accepted by one state but not the other. Spurred Lupine (correct name? ): Lupinus arbustus X sericeus - Wallowa Mts. Silvery Lupine: Lupinus argenteus ssp. argenteus var. laxiflorus - ? 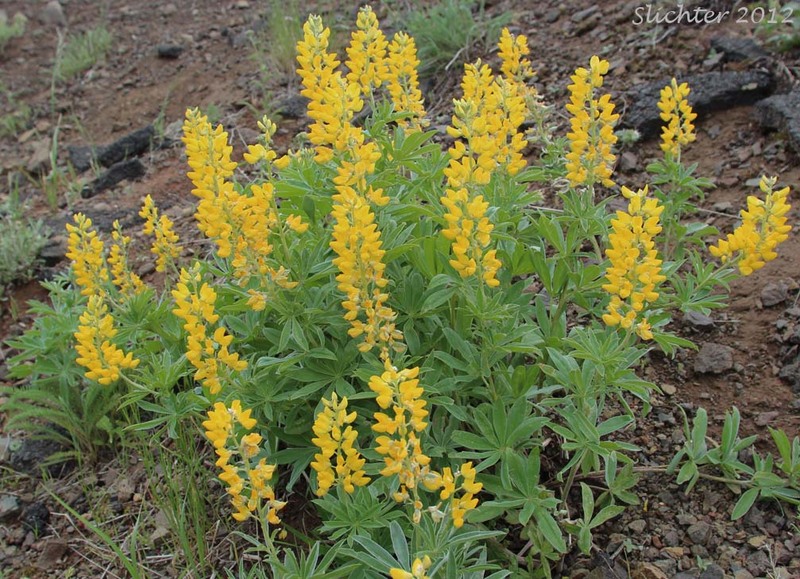 Bushy Yellow Lupine, Butter Lupine: Lupinus luteolus - Collection near the southeastern end of Klamath Lake, Klamath County, OR? Chick Lupine: Lupinus microcarpus (Synonyms: Lupinus densiflorus var. densiflorus, Lupinus microcarpus var. microcarpus, Lupinus subvexus, Lupinus subvexus var. transmontanus) - Annual. Hairy Big-leaf Lupine, Large-leaved Lupine: Lupinus polyphyllus var. prunophilus (Synonyms: Lupius arcticus var. prunophilus, Lupinus garfieldensis, Lupinus prunophilus, Lupius wyethii var. prunophilus) - In Oregon, this taxa includes Wyeth's lupine (Lupinus wyethii).